Flickr Photo of the Week (Week 27, 2009) – Happy 4th of July! Flickr Photo of the Week (Week 27, 2009) - Happy 4th of July! Happy July 4th from all of us at the Indiana Office of Tourism Development. We hope you all enjoy a fun and safe holiday. And, while you’re at it, be sure to take lots of great photos to enter in the My Indiana Summer photo contest. Monday (July 6th) at 5 PM EDT is your last chacne to enter the contest to win a FREE digital camera or a getaway in Indiana! Enter today! Fireworks and Summer go hand in hand. 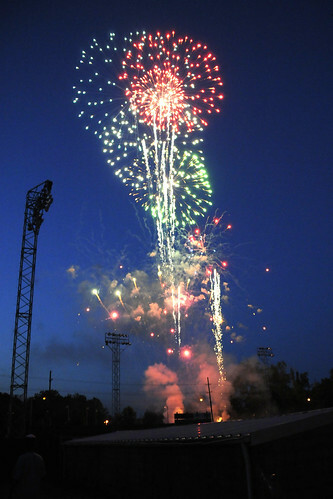 This pyrotechnic display comes from McBride Stadium, home of the Richmond RiverRats. 2009 is actually the inaugural season for the RiverRats. If you’re headed to Richmond this summer, be sure to check out a game while you’re there. Here are a few links to help you plan your next trip to Eastern Indiana.